Now having been delivered to 44 countries, the book has quickly become the leading publication on Close Protection. Effective, realistic and bluntly to the point, the book covers all aspects concerning operational and training requirements for both typical corporate and hostile environments without the inclusion of subjects that are simply not required. “ Having been trained by Richard Aitch as well as having had the honor and privilege to work alongside him, I knew before buying this book that it would be "the" Close Protection book to own. I have read many close protection books, none of them come anywhere near this one in terms of detail, it is literally an encyclopedia, it weighs a ton and 100% of the information is to be taken in and kept, nothing is to throw. No author has ever gone where Richard Aitch has dared to go, nobody ever went so much in depth on the subject and I take it this is due to Richard Aitch's skill being at a very high level, as well as his passion for the CP industry which is second to none. To make it simple, if you are involved in CP or if you are thinking of getting involved in CP, BUY THE BOOK ”. “The bulk of the book is not just a condemnation of the regulator - to sum up, he calls it ‘a travesty in the making’ that ‘churned out plastic clones of empty suits that were simply unfit for purpose’ - but a detailed and well-illustrated chapter by chapter description of the CP’s job, taking in threat assessment, planning, security of the principal’s residence and estate, unarmed combat training, communications, reconnaissance, and plenty on walking and travel - including tactical driving and getting in and out (embussing and debussing)”. “A very good informative book, well worth the money…will be promoting your book on our courses”. “My go to reference book has been Peter C's The Modern Bodyguard for well over a decade. This takes that incredible material and similar publications, to a completely new level. This may sound like a bit of a minor point, but the inclusion of that simple bookmark shows the attention to detail and thought that Rich has put into this. I've read a couple of chapters so far and it really is worth the investment”. Rick Smith, Senior Project Manager GID Event Security Co. Ltd.
“I have literally just received my copy through the post and am pleased to say it really is a quality product which will take some time to read through. Having given some bits a quick look over I'm impressed with what I've read so far and the layout and information in the Chapters is exhaustive and impressive. This will be a reference book for many as there is so much information available”. President at Enicom International & Group Of Companies Inc.
“We have one here at SOS and will be using this book on course and for a pre-read for students, after we have read it all ourselves of course. First opinion is it blows the other books out of the water just on the actual content alone never mind the ethos or operational experience of the author. This book fits in perfectly with our ethos and the way we train our students, well done Rich and I'm sure some bulk orders will be coming your way very soon”. “Best book I own, I have been looking for a book like this since I started out in Close Protection. I have read many and none of them ever went into as much detail as The Close Protection Book. I still have not finished reading the book yet and not even half way there but so far it is so excellent! Thanks again for fast shipping Richard”. “A colleague and friend of mine, who, after 32 years as a police officer, fellow firearms team member and police advanced/AP driving instructor, recently bought your book. Being the man he is, he went straight to the driving chapter. He told me yesterday that there was nothing whatsoever he could add to your prose - after twenty years as an instructor - well done. I will be having a copy in the near future”. “Upon reading the pre-release of this Close Protection Book I held high expectations of the content in reference to the quality of the contents and relevance to modern Close Protection Operations. I was not disappointed on both counts. 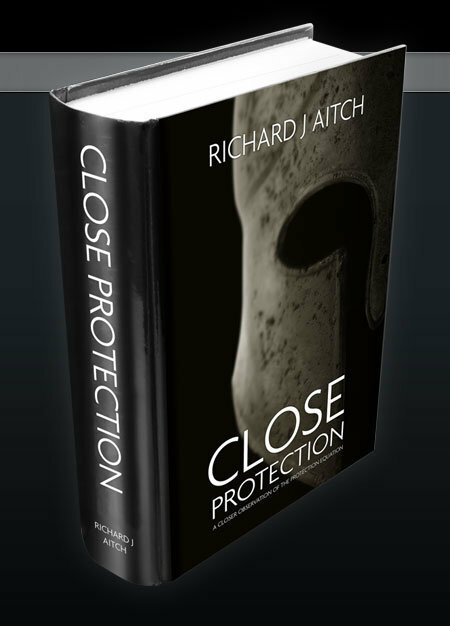 Richard Aitch has delivered without doubt the most comprehensive book on the market based on his extensive experience in the Military, Government and commercial Close Protection arenas. Detailed accounts of operations and in depth studies of doctrine ensures readers new to Close Protection and experienced Operators alike will benefit. Subjects such as Reaction To Attack, Protective Driving and Counter Surveillance are skills not covered on the UK SIA course and the book has reference to these in detail. The author appears to have covered all the bases to help the reader become a more informed and professional operator. A valuable source of information and an interesting read for those involved in Close Protection and the wider security industry”. “I have had good reason to study a lot of material in this subject and without question this is the most professional product I have seen to date”. “It is a must for any one that want to make a career As CP officer, it is well written easy to under stand as I'm French Canadian the book is so inspiring. Now I know we're I belong in the security industry. A+ Thank you very much for sharing your wisdom and expertise to the world”.